The﻿ BU﻿G Ja﻿ms - These are adult and mature teen jams, not lessons or workshops. However, the uke is so easy to play that even if you have never played before, we’ll show you simple chords to get you playing along right away. ﻿﻿Need help playing the uke?﻿﻿ Twin Cities Ukulele Club BUG jams will start with a ﻿6:30 p.m. half hour basic﻿ workshop﻿. This is for those who are new uke players or who haven’t played uke much or recently. The whole idea is to introduce and practice chords, chord changes, 1 4 5, and other concepts to new or less experienced uke players before the jam. Then, we will start playing songs right at 7. Never played a uke and want to get a head start - before the jam? Click here for Jumpin' Jim's Ukulele Tips and Tricks book. 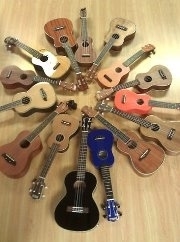 ﻿Whe﻿n - The 2nd, 4th and 5th Mondays each month from 7 to 9 p.m.
Who - The jam emphasis will be on ukulele. This jam will feature bluegrass songs as well as some songs from the old-time and vintage country genre. ​This jam is geared for adult and teen beginners to advanced uke players, with an emphasis an keeping things simple so all can participate right from the beginning. This BUG jam is free and open to the public. Wh﻿er﻿e - Kenwood (Park) Community Center – 2101 Franklin Ave. W, Minneapolis, MN 55405 - For more information about the Kenwood Park Community center c﻿lick he﻿re. For a map click here. Highly Recommended Resources f﻿or BUG an﻿d UkeAmericana Jams - We routinely use songs and tunes from our BUG Song and Tune List and Fav﻿﻿orite ﻿Old-Time American Songs﻿ for Uk﻿ulele, which is available at a number of places locally and online. For the BUG Song and Tune list, cli﻿ck he﻿re. All songs and tunes on the BUG List are available for free download to those who attend Twin Cities Ukulele Club jams. Most jammers print out these songs and put them in a BUG 3-ring binder for use at jams. For the UkeAmericana Song List, click here. We do not use the Daily Ukulele: 365 Songs For Better Living Yellow Book at the BUG jams. Questions - Auto﻿matic Notificati﻿on of Events - You may ask questions and sign up for automatic e-mail notification of the BUZZ, BUG and UkeAmericana jams by contacting TwinCitiesUkeClub@icloud.com. For a Twin Cities Ukulele Club information sheet, click here.